The salvia divinorum plant is indigenous to the Sierra Mazateca of Oaxaca, Mexico. The plant is also known as seer's sage, diviner's sage, ska Maria Pastora and salvia the genus name. Diviner's sage is a psychoactive type plant which can bring on dissociative effects. In mexico it grows in moist and shady locations and grows more than a meter high. 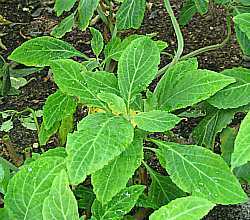 The salvia divinorum plant is used by the Mazatecs of Oaxaca to facilitate shamanic visions. The Mazatecs see S. divinorum as an incarnation of the Virgin Mary. The plant's ritual use involves staying in a silent place after the leaf has been eaten. It is also used as a diuretic and to treat ailments such as anemia, rheumatism, headaches and a disease known as panzón de borrego or lamb belly. There are several ways to take seer's sage both modern and traditional. One of the traditional methods involves the Mazatec shamans extracting leaf juices by crushing fresh leaves. Then these leaves are mixed with water to make a tea or infusion and then drunk in ritual healing ceremonies to induce visions.Another Mazatec method is to chew and swallow a large amount of fresh leaves. The dry leaves of the plant are smoked in a pipe; the majority of users prefer to use a water pipe in order to cool the smoke.Some people take salvia in tincture form; it can be diluted with water before it is taken. "We think that drugs derived from the active ingredient could be useful for a range of diseases: depression, Alzheimer’s, schizophrenia, chronic pain and even HIV or AIDS." Seer's sage is legal in most countries. The following countries control the use of salvia to some extent. These countries include USA, Russia, Sweden, Australia, Finland, Denmark, Canada, Belgium, Japan, Estonia, Spain and Italy. Seer's sage has been source of much controversy; there have been many media stories that compare slavia to LSD. They both contain salvinorin A but the big difference between the two is that salvinorin A occurs naturally in seer's sage while in LSD it is chemically semi synthesized. The various studies that have been done suggest there is no overall consensus about the long term effects of seer's sage.